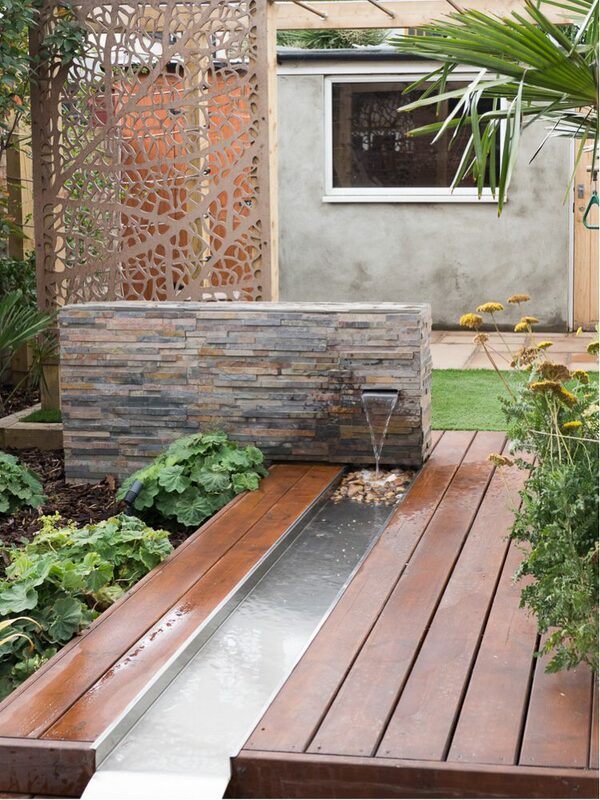 There is no doubt about it, adding garden water features to your design will give it extra sparkle. As well as the relaxing sound of water, you have reflection and light play added to your space. It can attract people and wildlife as well as providing a focal point. 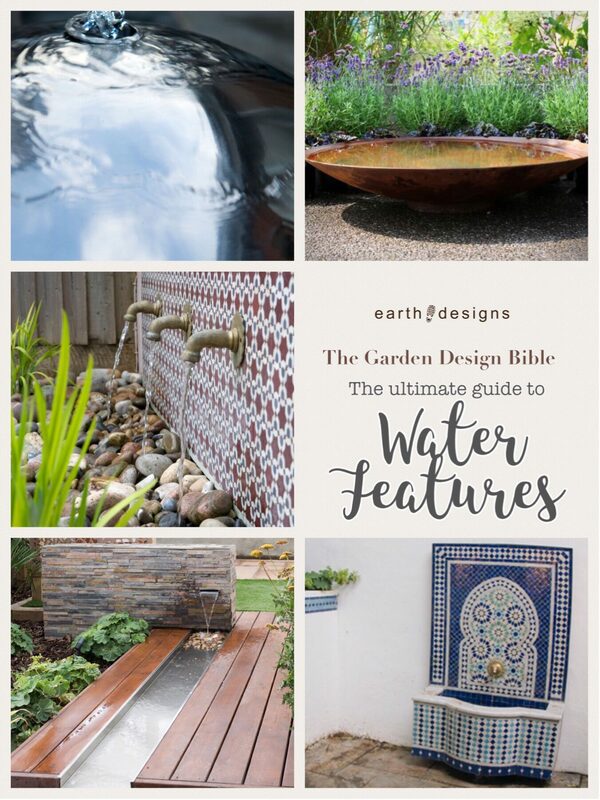 Pick the right size garden water feature of your space. This is the one occasion when super-sizing should be done with caution. Don’t include a pond that fills half of your garden. The proportions will be wrong. Positioning. Try and position your garden water feature so it is clearly visible from the house, as it will be a fabulous opportunity for lighting. Try to not have it in direct sunlight because it will cause it to get more algae quicker. Similarly don’t position it on the trees with falling leaves as it will quickly clog up the pump and filter. Safety should be a consideration but shouldn’t deter you from including a water feature if you have children. In fact, if you have the right feature it can be a wonderful playful adventure. Make use of any level changes in your space to add a fountain or pouring water of some kind. Maintenance – All garden water features will need the pumps and filters cleaning from time to time. However features with the reservoir are less likely to be needing a clean as often as features such as a pond that require more maintenance. 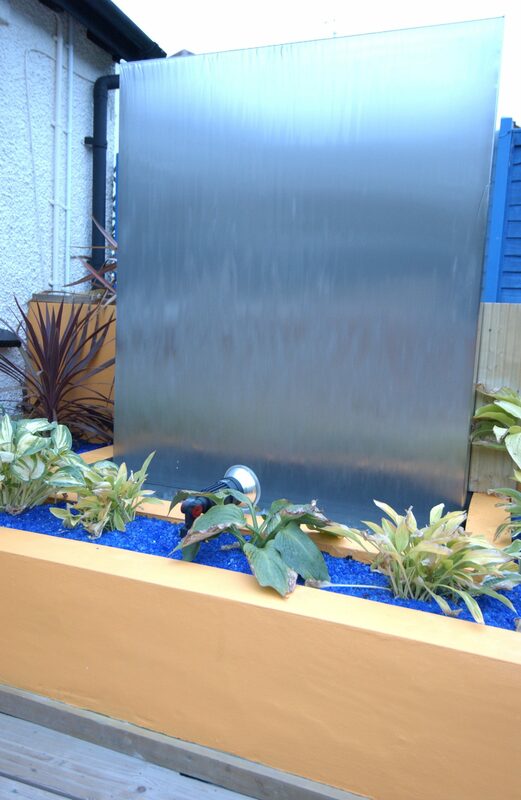 Water features do not need to be connected to mains water systems so do not worry about your water bill. Ponds are great for attracting wildlife. They can be any size or shape and suit most garden styles although probably more associated with a traditional garden. They are great for the carbon footprint and also for slug control as they will attract frogs and birds that should keep unwanted pests under control. The downside of them is the safety issue, and that they may need cleaning often if they get too much algae, or leaf fall. If you include a ledge when you dig out the pond, you can include aquatic plants. Remember as well to leave a slope so the wildlife can get in and out easily. Increasingly on the rise, reels are perfect for modern garden schemes. As a garden water feature goes, these are one of my favourites as they help make strong lines across a space. They can take any form, from stainless steel, through to tiled wills. 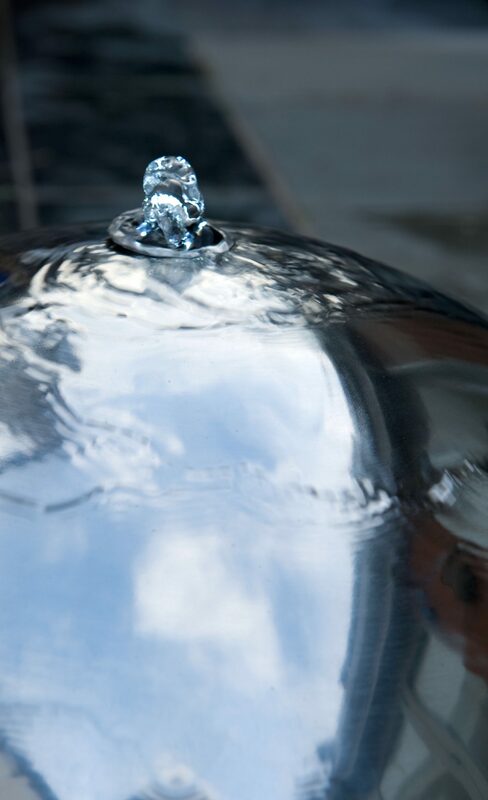 If it is the first time you are attempting a water feature in your garden, it is probably best to buy a pre-made part so it is easier to install. Perfect for small gardens. They come in many shapes and sizes and would fit with almost any style as there is so much variety. If you don’t have a garden wall to mount it on, you can build a plinth for it to be mounted onto in front of your existing boundary. This is perfect for focal point on the patio, or placing within a flowerbed for equal impact. 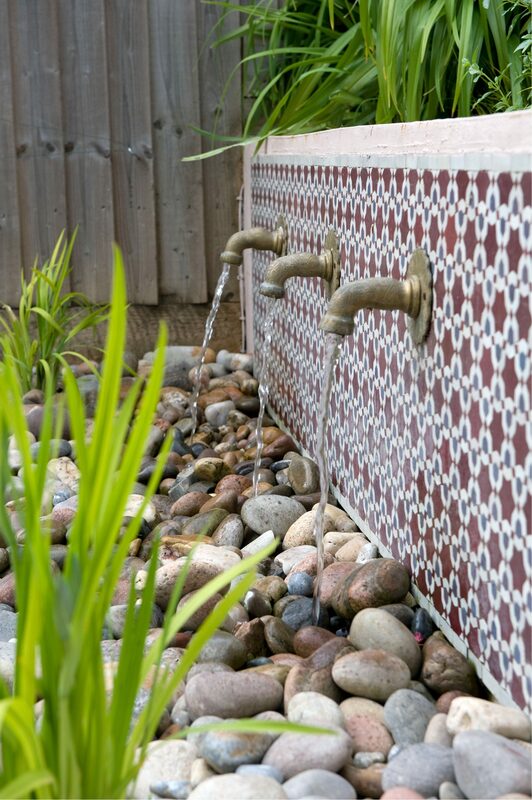 When you raise the water off a garden water feature, it makes it easier to interact with. 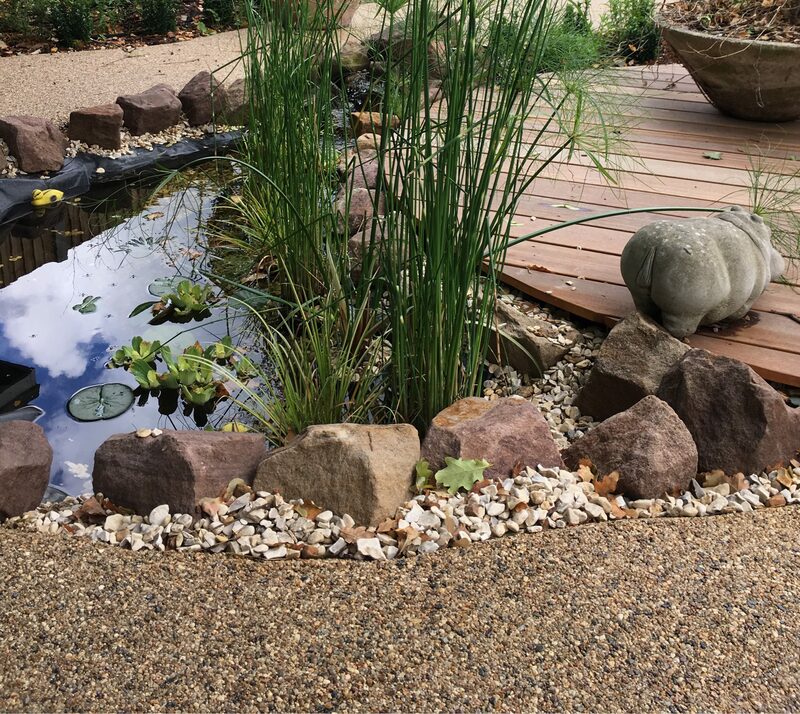 You can use anything to build the pond from bricks through to sleepers, and add a copper stone on the top so it is easier for you to perch on the edge and interact with the water feature. You can add a running water element for a great atmosphere builder. They do take up a bit of space however., and if you are using sleepers, you need to be careful that the toxins don’t bleach into the water and contaminate it. It can be difficult for wildlife to get in and out as they are sealed raised units. I am a big fan of water bowls. They can create such a great impact in any garden. 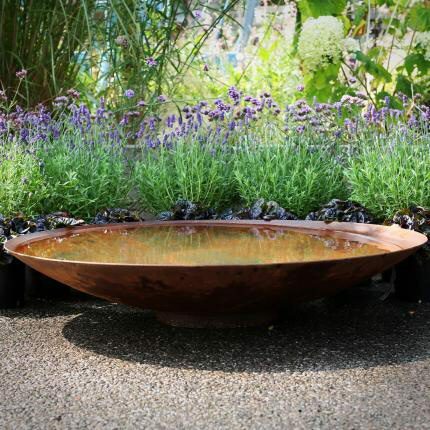 They are great for creating reflection and light into the space, A huge water bowl will make any garden seem bigger. You can add plants, and also a filtration unit if you so desire. They will need a mains supply to them, and you will need to check with the supplier if you want any kind of motion in the water. A solar powered garden water feature has come on leaps and bounds in the last few years. They are perfect for the DIY enthusiast. Make sure you place them in a sunny spot to guarantee solar charge. 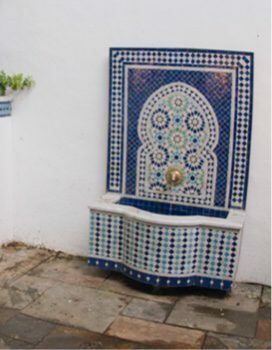 There are so many free standing garden water features on the market, ranging from Moroccan-inspired fountains right through to the more contemporary stainless steel water walls. Relatively easy to install, and maintain. If it is an enclosed unit (i.e. the sump is underground) they are super child friendly as well. There is a huge range to choose from, they’ve sure to pick some think that is in proportion with your space. Position it in a good focal point such as the view out of the back door, or the kitchen window. If you can manage it, liked it as well. You can also read more of our How To blogs here.